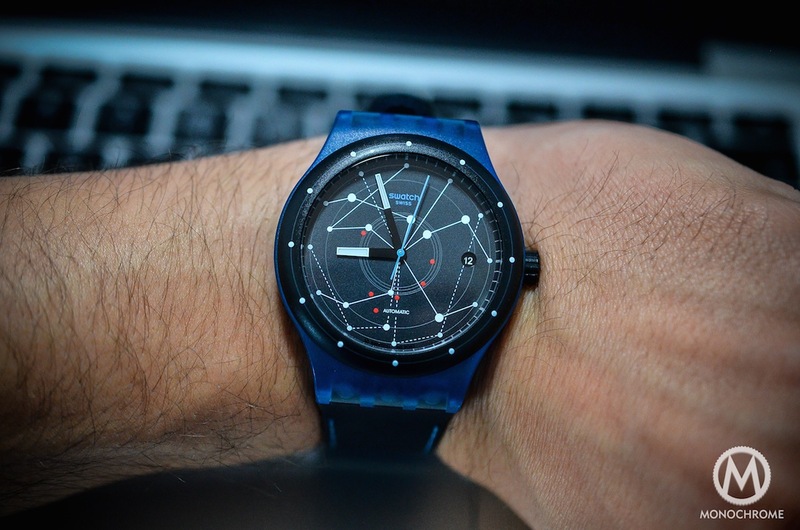 The Swatch Sistem51 is certainly the cheapest watch we’ve ever reviewed on Monochrome-Watches.com, and we are doing it without any shame or regrets. Why? Because the Swatch Sistem51 is clearly one of the most important new watches of the last 10 years. Like the first Swatch watch in 1983, this new automatic watch is a major industrial milestone that could (emphasis on “could” because, for the moment, we are not sure of possible future developments) change the face of the Swatch Group and indeed the whole watch industry. Swatch (which stands for “second watch,” because of its affordable price and casual look) was born in the early 1980s, right in the middle of the so-called quartz crisis. At that time, the watchmaking industry in Switzerland was intensely affected by the arrival of cheap Japanese quartz watches and production numbers became lower than at any time before. However, a very simple but clever idea saved the Swiss watch industry. In fact, we can trace the rise of haute horlogerie, luxury watches and independent watchmaking directly to the simple, cheap quartz Swatch watch that made its debut in 1983. Swatch was born under the leadership of Ernst Thomke, CEO of the movement maker ETA, who was aided by a small team of engineers. Using the concept of the Concord Delirium (the thinnest watch in the world), Thomke designed a watch with a caseback used as the main plate of the movement. The Swatch was devised as a Swiss-made plastic watch with a fully integrated and in-house-built movement. 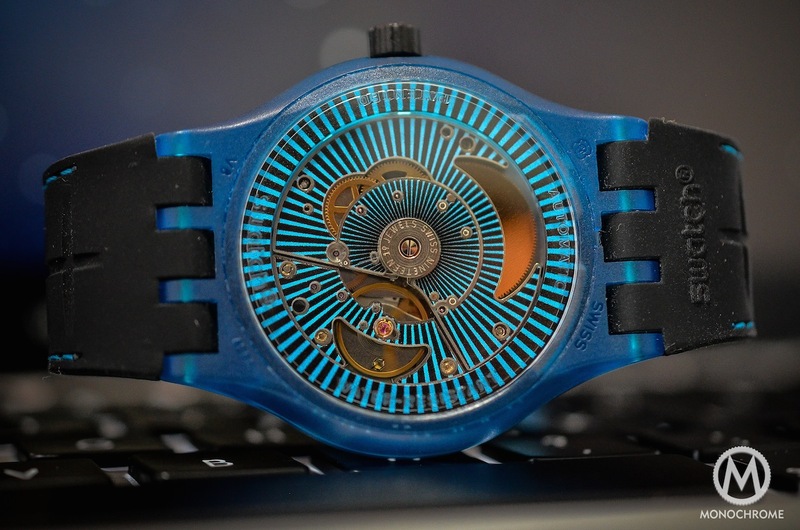 Compared to mechanical watches, a Swatch was 80% cheaper to produce due to fully automating its assembly and reducing the number of parts to only 51 components. The first collection was introduced in March 1983 at an initial price range comparable to those of Seiko and Citizen’s watch collections, but it was the first such watch developed and manufactured in Switzerland. Helped by an aggressive marketing campaign, sales were huge, and overcame the targets of one million pieces for 1983 and 2.5 million the next year. Nicolas G. Hayek, with a group of Swiss investors, bought Swatch in 1985 and used it as the foundation of what is now known as the Swatch Group. Because of the Swatch watch’s success, the whole Swiss industry took advantage of its creation. The renewal of many brands, and the birth of our favorite independent watchmakers, are partially due to the Swatch. It may be a simple and cheap plastic timepiece but it proved to be a historically important one. The Swatch Sistem51 brings back the idea of the 1983 Swatch with one single difference, its movement. You’ll find the same basic concept of a plastic watch, Swiss-made, developed in-house, with a 51-part movement fully industrialized and for a very low price (about $15o in the U.S.). Everything that characterized the original Swatch watch is here, except for its automatic mechanical movement. It is not the first automatic Swatch — some of them used to come with ETA movements — but this one adds something more. When it was presented at Baselworld 2013, the Swatch Sistem51 created a real earthquake in the watchmaking industry, a mixed feeling of astonishment and fear. How was it possible that a Swiss-made watch with a manufacture movement (and not the worst one we’ve ever seen, either) could be sold for a fraction of the price of an ETA-powered Tissot? It was accomplished by using synergies inside the Swatch Group and applying the same magic trick that the 1983 Swatch used. Under its fun and inexpensive exterior, the Sistem51 is a real industrial achievement and shows an amazing intelligence in its conception. In order to keep a low retail price, the movement is fully made by machine, without any human intervention, even to adjust the accuracy of the balance wheel and the escapement. The movement of the Swatch Sistem51 is a real engineering feat, albeit far from what passionate watchmakers are used to producing and not at all the “traditional” way to develop a movement. It may be cheap, but it is a really interesting engine that boasts more technology than any other ETA, Soprod or Sellita. To build this movement, ETA, Swatch R&D, Nivarox and Comadur (all part of the Swatch Group) joined forces working over a period of two years to create, from scratch, a highly complex manufacturing process that led to an incredibly simple movement. The genius of the Sistem51 is that it’s made of only 51 parts, spread around five modules and linked to one another by only one central screw. The assembling of the parts, including the 19 jewels and the regulating organ, is done by machine and uses only solders. The balance wheel’s assembly and adjustment are usually the most sensitive tasks when manufacturing a movement. It requires the skills of trained watchmakers to achieve a good chronometric rate. In the Sistem51, it is adjusted by a laser that removes enough material to find that perfect balance, and therefore the perfect accuracy. And as the balance wheel and the escapement are made of a synthetic and anti-magnetic material, there is essentially no reason for them to deregulate. 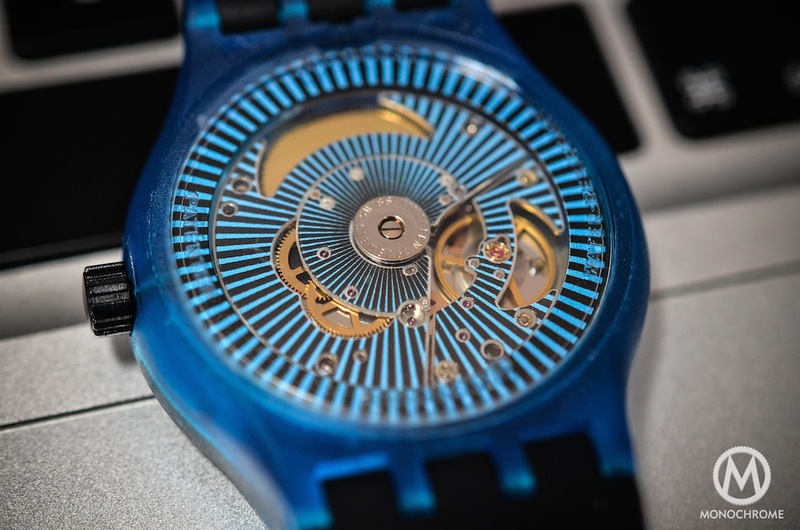 The Swatch Sistem51 comes with several other innovations, such as bridges and plates in ARCAP, a material used by very high-end watch brands such as Urwerk. The main advantage of ARCAP is that it is anti-magnetic and non-sensitive to temperature changes. The movement boasts 90 hours of power reserve, an impressive achievement compared to the 42 hours of an ETA or a Soprod. A bidirectional transparent rotor (which will never hide the view of the technical elements, as the counterweight is located around the rotor) winds the single barrel. Once again, such a detail is usually only found in fine, expensive watches. Last but not least, Swatch states it has an accuracy of +/- 7 seconds per a day, a rate that is actually very close to COSC chronometer requirements (-4/+6 seconds per a day). The main question that remains about the Swatch Sistem51 is about its reliability. Far be it from us to worry that the movement won’t be solid or accurate, but what if a problem should arise? The balance wheel and escapement mechanism cannot be adjusted. Worst of all, the caseback cannot be removed. We are guessing that people will do the same as they did when they ran into problems with the quartz Swatch: considering the price, simply replace it! It would be more expensive to repair it anyway. That’s clearly something we are not used to, especially because we love vintage watches and restoring our old beauties. But it may be the future. The Sistem51 comes with the attributes of much more expensive timepieces. It has an impressive accuracy and power reserve, but also a quick date (which will change directly at midnight and which you can adjust via the second position of the crown, without changing the time) and a hacking second mechanism (the second hand stops when pulling the crown, to finely adjust time). The last feature, which may sound unimportant, is that it can be wound by the crown. Just remember that some old and very cheap Seiko watches didn’t have such a device. In its appearance, the Sistem51 is a simple three-hand watch with date, but a more complicated one by virtue of its movement and features. It has everything an ETA-powered watch has and even more, but for a fraction of the price. 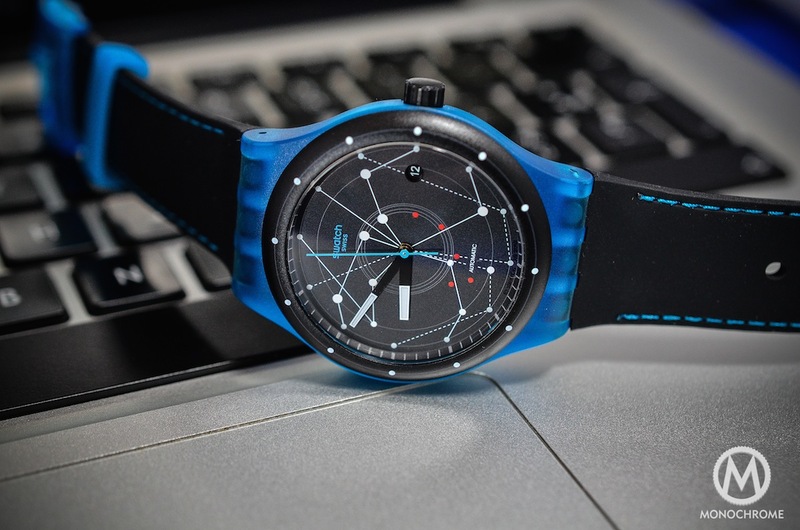 The Swatch Sistem51 is visually a Swatch, no doubt about it. The translucent case is, in every aspect, similar to a quartz Swatch, but even though made of plastic, it looks quite solid and well finished with a fine-grained texture. It’s available in four versions: blue case with a black dial, red case with a black dial, a full black edition and a full white edition. The entire collection comes with a celestial pattern on the dial. The red dots represent six of the jewels and the white dots the weld points of the movement. On the wrist, the Sistem51 is slightly bigger than the brand’s other watches, at 42 mm in diameter. What doesn’t change is the comfort, helped by a very light weight and the softness of the rubber strap. The Sistem51 looks cool and will be perfectly suitable for weekends. 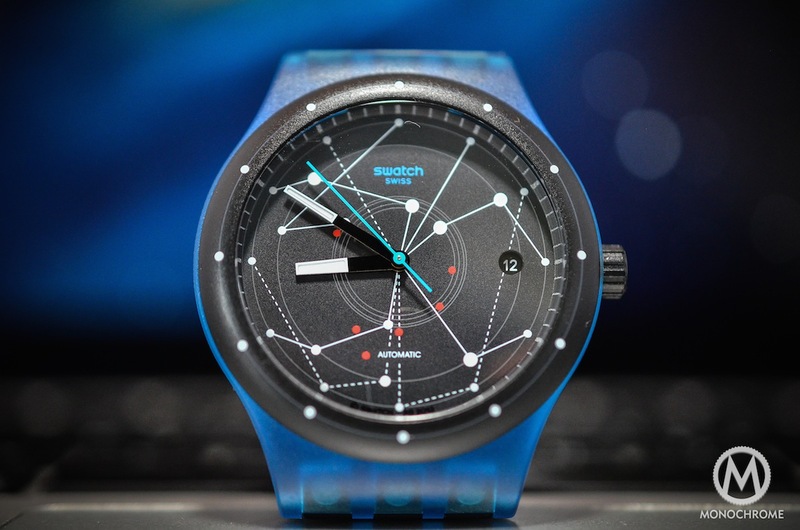 The Swatch Sistem51 is inexpensive, it has a plastic case, and it doesn’t offer any fancy complications. It is not what we would normally call haute horlogerie. It is, however, an important watch that may herald the future of mainstream watches. It is an astonishing industrial achievement, the first mechanical watch built without any human hands. Moreover, it ushers in more innovations, technology and content than any other inexpensive mechanical watch. It is clearly the new trand-setter for the entire watchmaking industry. Most impressive of all, did we mention it costs only $150? Only the Swatch Group would be able to achieve all this. You may love it or hate it, but no one can deny the great progress it represents. One question still begs to be asked, however. We know that upscale brands will never use the complete Sistem51 movement, but what about the Swatch Group’s lower-end brands, such as Tissot, Hamilton, or even Longines? Would you accept such a movement in any other watch besides a Swatch? Keeping it light, this is a fun, affordable watch that many will love. Of course, non-watch addicts will like it because it is an affordable — possibly the most affordable — Swiss-made automatic watch. But watch enthusiasts like us (and, we suspect, you) will know that it is all about the movement: accuracy, innovative materials, innovative industrial processes and high-end features. I have a metal cased variant, coming up for two years old, which has been worn daily. Now stops frequently, has effectively zero power reserve. Very disappointed. would not recommend. Had a Vostok Amphibia – was way better, and less than half the cost. My Sistem Blue has been running for a week since purchase , and against a more sensible and logical timekeeping device (Swatch Rebel) has been doing minus 2 per day , on my wrist , and seems impervious to shocks or being left alone. I don´t supervise railways , and am not an airline pilot, and no-one dares tell me I´m late for whatever, so coolness meets coolness. I like the noisiness going on in there , due to the plastic casing, which reveals a louder tic-tic than you´d hear from a metal-cased watch, and a rather wild spin of the whatever you call it ring that winds the watch. . I´ve had those stilted highbrow crown-logoed watches that watch fans adore, and frankly , the resentful askance looks are counter-constructive; fun is more approachable. If this watch lasts its expected 20-year lifespan I´ll have been happy for the companionship, and I´ll be 73 by then. My gripe with this watch is that Swatch have given up , have they? printing on the face the year of design my Rebel shows very discreetly Swatch AG 2010, and I have some Musicalls from the nineties, a Hearstone from 1987, and my first ever Swatch was a leafy pattern from the eighties , a 1987 Waipitu , long gone. This derogatory exclusion of heritage miffs me but not too much. Am really enjoying this mechanical timekeeping screamer ! DO NOT BUY THIS WATCH. It is the worst watch I have ever owned. I need to use a pliers to work the crown. The customer service at the local store and online was the poorest of any company I have dealt with. Buy a Seiko. My biggest mistake? Switching from a lifelong Seiko owner to a Swatch. Never again. I agree! I bought 2 pcs. of this model, after 2 years, both are not working. The automatic movement of this watch is a junk! Too expensive for a disposable watch! The Swatch conglomerate should offer a tontine (google it) to the person who actually owns one of the last remaining units that is still running twenty, or ten, or maybe even only five years from now. Redefining conspicuous disposability with a nonrecyclable, flimsy, plastic article of passing fashion is a pretty lamentable direction for this corporation to be taking; I suspect the real goal is hoping a percentage of buyers will get bitten by the bug, and begin buying up the levels of the ETA brands. It is a gamble, but the group’s recent decision to constrain repair parts distribution is rapidly earning condemnation from independent watchmakers around the globe, and that is a very poor strategic decision in the long run for an industry that needs service support to maintain investments in collections, not kiosks dumping cheap plastic. The Chinese will always win that gambit anyway. mine is not working properly right now after only just two years. even wearing it, it will momentarily stops. and will work only upon shaking your my arms, then will stop again. Hi. Just wondering what is the useful life expectancy of the Swatch Sistem 51(how many ~ years is it expected to run with reasonable +/- time gain / loss. Dont buy this watch! It will work probably fine just one year. After the second the mechanics will not be working properly so after a little more than two yrs (after the warranty!) it is basically a piece of trash. Buy any other watch – not a Sistem 51 from Swatch! Is this fact based on personal ownership, or your personal internet opinion? I have the same experience. Mine went on for about 18 months, and now it just stops. At this point, I have a 5 minutes time loss PER HOUR. Since it cannot be repaired, it became an expensive paperweight. I would prefer a vostok Amphibia at 1/3 the price ($59). It has a serviceable and repairable 2416b movement with all the flaws of a human assembled calibre. It can also be easily regulated to good accuracy (+/- 6spd is achievable) and is water resistant to 200m. Easily modded and at $59 it’s more disposable than the Sistem51. Compare this Swatch model with any model of Seiko 5 Seiko 5 Sports with the new 4R36 automatic caliber 24 jewels and manual support, all made of stainless steel. Anyway … I do not understand these reviews …. For some, the all plastic structure is a plus. I am buying one for my daughter whose skin reacts to metal (even stainless steel). The battery powered swatches still have a metal panel on the back covering the battery, but this one has no metal to touch the skin at all. It’s a big world of watches out there, there’s something for everyone. First of all I think Watch Time should have printed a new article on the Swatch Sistem 51 with updates on new models and any other news that has recently come out. Second and more importantly since Watch Time professes to be the experts they could at least get their facts straight on features of the Sistem 51 such as it most definitely does not have a hacking feature allowing one to set time precisely. To quote your old article, “hacking second mechanism (the second hand stops when pulling the crown, to finely adjust time).” Nonsense! there is no such feature. Very disappointing article reprint and you can’t even get the facts straight a second time. Shame on you! I own two Sistem51s and they do indeed allow hacking. Adjusting the time backwards halts the second hand, and turning the crown slightly in reverse will hold the second hand without changing the time. The second hand does sometimes jump around a few seconds in both directions, and will even count the seconds in reverse briefly, but it isn’t difficult to get the second hand where you want it. A cheap $59 vostok 2416b movement has that work around hack too. I purchased a Sistem51 Black in August 2014. Lovely watch, supremely comfortable due to its low weight and the leather strap. I’ve never tested the power reserve all the way to the end, but I can easily leave take it off on a Friday afternoon and pick it up on Monday morning still running. The accuracy is also insane. Mine is accurate to within 1 (one!) second per day. BUT… I have noticed that the accuracy suffers if you go deep into the power reserve. If you wear it every other day (or even every day), the accuracy is phenomenal. My only gripe is with the plastic “crystal”. I am so used to sapphire crystals that mine has picked up quite a few scratches. I love this watch and will gladly recommend it to anyone looking to buy a first Swiss mechanical watch. btw Im in the same boat with the “plastic” crystal. But i figured a way to rid off those scratches. toothpaste and car polish , one drop, and rub with a microfibre cloth, works wonders!! I bought Swatch Sistem51 last XMAS and my personal opinion is that this watch is not rich the target at all. It’s tricky to set corret time. Crown is very hard to pull out. Fully wounded watch doesn’t run 90 hours as is promised the best case is less than two days. Watch suddenly stop very often, lost many hours and start running again. Plastics eclosure change the colour. Watch is not shock resistant at all. It is not reperiable. At the end I’d like to replace watch for something else from Swatch group. I purchased a blue on while in Rome last November, and though it will never replace my other mechanical watches, I just love it, usually wear it for work, very comfortable for all day use, hardly know it is on. A great innovation in the industry! The Swiss came back successfully in answer to the quartz revolution with expensive, sophisticated mechanical watches. Now they follow up with cheap plastic mechanical watches that are far less accurate than the cheap steel quartz watches. Engineering achievement indeed but why bother. Estimated life span 20 years. Maintenance free. Weight 30 grams (ala Richard Mille, but $500,000 less). Most comfortable band I’ve ever worn. Come on WatchTime! I know that you can do better than just taking the same old content and putting today’s date on the article and republishing it! Also three new models since those additional 5 (and some of the original models, including the all-black one, seem to have been discontinued; at least it’s gone from the Swatch US website). 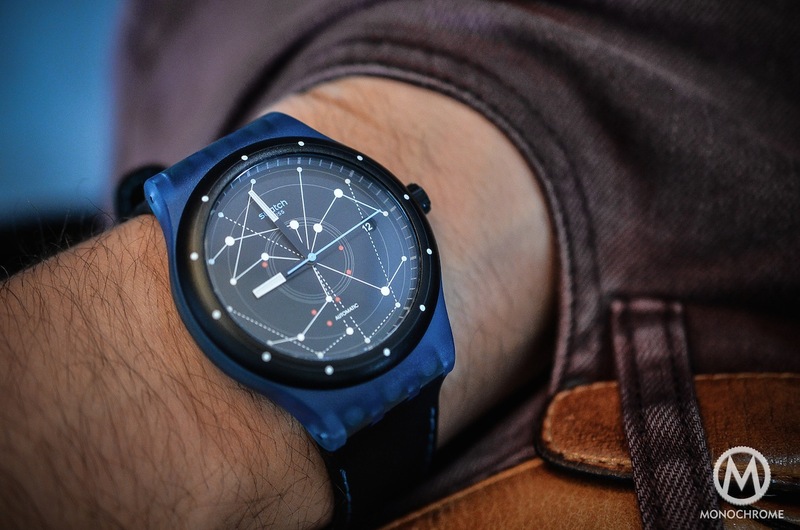 I just bought one of those new ones – off-white face with concentric numerals and a dark blue silicone strap. Also new are the camoflage strap and dark blue metallic dial, and a tangerine orange strap and case. Is anyone really getting 90 hours power reserve? Despite winding it after I take it off, the best I’ve gotten is 30-40 hours. Yes. I fully wound it up before leaving it behind on a trip, and it was still running after 88 hours when I returned. So, no consistency despite the robots. It’s not a big deal but the rotor is loud and when you want to manually wind it, it is counter clockwise and it makes an awful noise. It does have a hacking feature – adjusting the time backwards will stop the second hand, and holding the crown slightly in revere direction will stop the second hand without adjusting the time. But no it doesn’t fully advance the date until about 1:30am. It may just be rumour but next years’ Swatch minute repeater plays the Teletubbies theme on the hours. I read about it from Watchtime.com and had been looking for it in France last fall without success. Through a friend travelling to Geneve, I got 4, yes, one colour each, for our family last week and we all love it.